Before you start designing your man cave, imagine what you want it to look like. Chances are, your dream man cave has a specific theme. You may want to go wild with the theme that relates to a hobby or interest, like a NASCAR theme, a tiki theme, or a football theme. Alternatively, you might want to design your man cave to mimic the appearance of a trendy bar, movie theatre, or arcade. When you decide upon your theme, let your designer know so they can work with your theme. For instance, at Space Age, we build custom storage solutions that can double as a bar area, or build custom shelving for your sports, movie, and video game memorabilia. What kind of furniture does your dream man cave incorporate? Does it feature a comfy couch or reclining chairs? Maybe you want lots of seating so there’s room to socialize, or a private nook so you can quietly read your favourite books. The amount of furniture in your space will affect your custom storage solutions, particularly if your furniture is pushed against the wall. If you plan on placing a large couch against the main wall, you can maximize your storage space by building a custom shelving around the couch. Not only will the shelving beautifully frame your furniture, it’ll ensure that your favourite movies, games, books, and collectables are always within reach. If you plan to have your man cave double as a guest bedroom, a custom wall bed is an ideal choice to maximize your floor space. What’s a man cave without entertainment! Your man cave will probably feature staples such as a television and video game console. You may also want to consider adding a pool table or a dart board, so you can play with friends. While televisions can sometimes be unsightly additions to rooms, custom shelving can be built around the television to transform into a focal point. If you collect DVDs, custom shelving is an ideal way to display your collection and frame your widescreen television. Custom shelving can also be created to store your prized video games. If you play computer games on a desktop or laptop, a built-in desk can also be added to your man cave. If you’re turning an unused bedroom into your man cave, you probably have a basic reach-in closet or walk-in closet to contend with. While it may be tempting to use the closet to haphazardly stash boxes full of ‘stuff’, custom closets can help you make better use of that space. Custom closets can be specially created to suit your unique storage needs. For instance, if you’re not using the closet to hang clothes, you may want to remove the railing and install shelving. If you have a walk-in closet, you can transform your closet into a beautiful showcase area for your memorabilia and collectables. 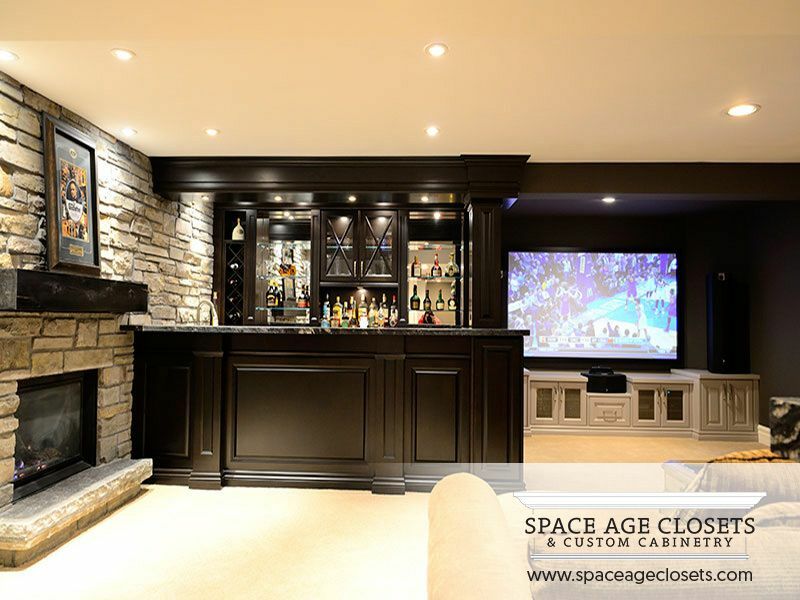 Whether you want a man cave, game room, custom shelving for your living room, or custom closets in Toronto, the experts at Space Age can help. For the past 30 years, we’ve been partnering with clients in Toronto and the GTA to design, build, and install their perfect storage solutions. Contact us to learn more about our services and to schedule a complimentary in-home consultation.